Usually how it goes is that we see new collection solicitations in catalogs first, and then the online listings show up second, but every once in a while those online listings outpace everything, and there's a whole slew of interesting ones that just showed up. Among these DC Comics books (which seem to be scheduled for release between May and July 2016) are New Titans collections around the "Total Chaos" crossover; some unexpected material related to Suicide Squad and also Supergirl, two of DC's hot media properties; spotlights on some of my favorite Greg Rucka work; the mystery of the recently-solicited Batgirl Cassandra Cain books; a dedicated Killer Croc collection(?! ); and more. Dive in and take a look at what might be coming up. Remember all of these listings are subject to change before publication. For a couple of years now we've been talking about the cancellation of the Starman Omnibus Vol. 3 paperback, which ended the paperback reprints of the hardcovers mid-series. Many collectors who bought volumes 1 and 2 of the paperback series felt let down that it didn't continue, especially since many of the hardcovers are out of print. For a long while "phantom" solicitations for the Vol. 3 paperback could be found online that were really just artifacts of the original cancelled volume; some of these were future-dated, and it's possible that this latest solicitation is just one of those future-dated listings with the listing getting close. I don't want to get your hopes up, and don't believe it until you see the book actually officially solicited. At the same time, the fact that I'm posting it means I think it's worth watching. 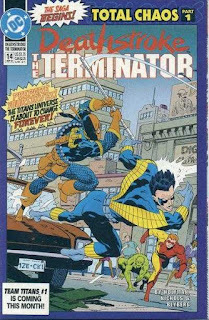 Following the solicitation for Deathstroke, the Terminator Vol. 2: Sympathy for the Devil is this solicitation for Deathstroke Vol. 3, which appears to collect issue #14-20 and whose solicitation, you can see for yourself, mentions Lord Chaos from the "Total Chaos" crossover with New Teen Titans and Team Titans. You might've been thinking that Deathstroke book would read a bit funny without the "Total Chaos" issues when ... lo and behold, a Titans: Total Chaos collection solicitation. No word yet on the exact contents, though "Total Chaos" was New Titans #90-92, Team Titans #1-3 (yes, I bought five copies to get each of the different back-up stories) and Deathstroke #14-16. The latter Deathstroke issues weren't really that connected, however, and "Total Chaos" was really part of a larger Titans storyline that began back in issue #71 with "Titans Hunt" and concluded roundabouts issue #100 (when artist Tom Grummett left the book, though writer Marv Wolfman would remain). Two interesting Suicide Squad-related books, which I think are worth noting because they acknowledge the breadth of the Suicide Squad beyond just Harley Quinn and Deathstroke. The Silver Age Suicide Squad stories are considerably removed from the current incarnation, but star Rick Flag in weird war/Challengers of the Unknown-type stories. And then I love that DC is acknowledging the 30th anniversary of Legends which, not coincidentally, was written by Suicide Squad's John Ostrander and introduced the Squad into the post-Crisis on Infinite Earths DC Universe. No word on the contents but I'd be happy to see this anniversary book collect beyond just the miniseries to some of the tie-ins. What's prompted a spate of new DC Comics/Greg Rucka collections, I'm not sure (too much to hope Rucka might be returning to DC? His recent prominent Star Wars work), but we see here collections of some of my all-time favorite comics. Rucka's Checkmate is a brilliant geopolitical spy thriller using a who's who of DC Comics characters; his Wonder Woman is also great superheroics by way of West Wing. Superman: Sacrifice is kind of an oddball addition here, but it is that famous pre-Infinite Crisis Maxwell Lord story and involves Superman, Batman, and Wonder Woman, so maybe it's being pitched to tie to the new movie. Either way, more Greg Rucka collections is always a good thing. Three very different Supergirl collections to coincide with the continuing new TV series. The Silver Age paperback undoubtedly includes Kara Zor-El's first Action Comics appearance and stories of that era; Daring Adventures, in contrast, is the early 1980s stories of Supergirl in Chicago, shortly before her death in Crisis on Infinite Earths. Cosmic Adventures is the popular miniseries aimed at younger readers by Landry Walker; there's been for a long time a sequel rumored, and I wonder if sales of the new collection would help move that along at all. One of my absolute favorite Triangle Titles Superman stories, and one that it's probably fitting for DC to re-release about now, since it heavily involves Supergirl (the Matrix version; Panic would re-introduce her as a member of Superman's supporting cast shortly before "Death of Superman") and also because it leads in to the stories collected in the recently-announced Superman and the Justice League of America collection. What had been DC Comics: Elseworlds Vol. 1 appears to now be listed as Elseworlds: Batman Vol. 1; hopefully this is still a collection of previously-uncollected Batman Elseworlds stories and not the better-known material like Thrillkiller, Red Rain, etc. On the heels of it, however, there's now a DC Comics: Elseworlds Vol. 2 solicited, which at this point might very well morph into another character-focused collection. The recent announcement of a new relationship between DC Comics and Milestone came with the promise of both new graphic novels and new collections. It would be nice if, in DC's recent style, this new Icon collection included more than issues #1-8 from the original collection, or at least if the next collection was more complete (it skips from issue #13 to issue #19, etc.). Of course, to really be complete we're going to need collections of the "Shadow War" Milestone crossover and also the "Worlds Collide" DC/Milestone crossover. With the popularity of the new Mark Russell (mini)series, this appears to collect both the original Joe Simon four-parter and also the Ed Brubaker one-shot (no word on the Sandman story). UPDATE: Also apparently a new run of Matt Wagner's Sandman Mystery Theatre, which was never fully collected and tied in with Starman, quite apart from being great on its own. Troublingly to be sure, the recently announced Cassandra Cain collection Batgirl Vol. 1: Silent Knight is now showing signs online of being cancelled; however, there's a listing online now for a second volume. Hopefully this just means a change to the first book and not outright cancellation. Killer Croc is a Batman villain I really enjoy mainly because he's not as over-exposed as your Jokers or Two-Faces, and still lends himself to a variety of interpretations, albeit Batman: Broken City, Gotham Academy, Batman: Earth One Vol. 2, and so on. I'm very curious to see what "classic" Killer Croc stories DC collects for this volume. As I was discussing on the Facebook page the other day, this book has changed from being called Legacy/Contagion to Legacy and now Contagion. The contents listed are still the "Legacy" event's issues however, which makes me hopeful in a convoluted way that this will become Contagion with "Contagion"'s issues, and then that a true Legacy collection will follow. The recent Robin Vol. 1: Reborn collection was solicited to contain the first and second Tim Drake Robin miniseries, plus Batman #455-457, which to be very exact would collect the aftermath of the death of Tim Drake's mother without collecting the event itself. When released, this book actually contained the first miniseries, the Batman issues, but then also Detective Comics #618-621, so both the death and the aftermath. This second volume is solicited to include issues #6-10 of the Chuck Dixon Robin series, but probably now it's the second miniseries and maybe even the third. No word yet on the contents but I'd be thrilled if this was going to start collecting the whole Alan Grant run. The first Wonder Woman by George Perez Omnibus collected all the early already-collected issues of Perez's Wonder Woman run, and so there was some question whether another volume would ever be released. It would certainly be great if this second volume finished out Perez's run, going all the way to issue #62 even if that made the book a little bigger than the first. I only have one of the Starman omnibuses--the second one since the "Sand and Stars" trade is rare--but as I start selling off trades I might start getting these new collections to streamline my bookshelves. The next paperback or the one beyond that will collect Jack's meeting with Jor-El in the past. It's worth mentioning in the light of the Krypton series that's being developed. What signs show that Batgirl: Silent Knight is cancelled? Regarding Total Chaos, if they'd put in it some of the prologue issues from about #85-86, they could later release Titans Hunt that would collect issues up to those and thus have #71-93 or wherebouts in two books. Nice mapping on Total Chaos. Still a little odd to release Total Chaos before Titans Hunt. The Batgirl: Silent Knight listing has disappeared from some online listings plus other independent confirmations. I'm still hopeful it'll be published in some different form. Amazon would remove it. It was still included in Diamond update from last week. And it's not in Edelweiss catalogue, but that's because it never was there. It would be bad if it didn't happen. Damn it, now I see that Amazon listing is a zombie. So that would be it I guess. I was hoping Wonder Womans upcoming 75th anniversary would spur some reprints of the Rucka run. Although it begs the question, with the popularity of Flash's tv show and his 75th bday,why no Waid repronts? We've got new Chuck Dixon collections, so, y'know, stay hopeful. Looking forward to several of these. But why on Earth isn't DC putting together a collection of the 1982 Fury of Firestorm series?!? Back in the 80s it was one of their top-selling books (outselling Batman and Green Lantern). Boggles the mind. He's got an upcoming mini-series written by Gerry Conway. He just had a statue, with another action figure on the way. Oh yeah, he's also on TV on THE FLASH and in a few months LEGENDS OF TOMORROW!! Millions of people are getting exposed to the character. I just can't fathom why they haven't solicited a collection of the Conway/Broderick issues. What was the classic Firestorm collection a couple years back? How would that coincide with the collection you're describing? That was the five issues of the first Firestorm run, by Conway and Al Milgrom, with the Firestorm backups from Flash included (George Perez's first DC art, I think). That title was canceled during the Implosion, and the one Shag is talking about is after Firestorm joined the JLA. It was really good, and nice art by Pat Broderick for many issues. Crossed over with Captain Atom? There was a collection of the Conway/Milgrom issues to coincide with the New 52 Firestorm series. It didn't sell very well. However, those issues weren't big sellers even back in 1978. The 1982 Conway/Broderick issues were massively successful, plus now Firestorm is on TV. Wouldn't it make sense to sell a collected edition of a character in front of the public, specifically collecting the issues that actually were popular and sold well originally? Trying to sell the old edition right now would be like trying to sell a collection of 1960s Teen Titans to viewers of Teen Titans Go. Just doesn't make sense. Passion is OK. :-) Ever think you'd be watching Firestorm in a live action network TV show? Never in a million years!! Plus a main character in a spin-off?!?! Insane! Pinch me, I must be dreaming! Question... If I were to start an online petition asking DC to collect the 1982 FURY OF FIRESTORM run, how many signatures would you think I'd need to get DC's attention? I say this knowing DC probably would ignore these efforts. I'm guessing DC would want to sell at a minimum probably 25,000 copies (total guess on my part). So should I shoot for 10,000 signatures (an impossible goal)? Or would 10% suffice (2,500 signatures) knowing they would sell a bunch more than just the few people we could reach through social media? Anyone ever do anything like this before? I hope that Daring...Supergirl volume gets published. I'm glad now I didn't buy the digital issues, although I did of the 70s Prez run. I'd really like to see Supergirl's early 70s stories from her own magazine and Adventure Comics, the run post-LSH. Really liked those a lot, and they were fairly feminist for their day, like the Diana Prince stuff. I was excited to see these were the just-pre-Crisis on Infinite Earths-era Supergirl stories (though likely not the whole series). You know me, I'm not much for Silver Age material, but a deep Bronze Age cut, especially one that dovetails into Crisis, that piques my interest. These had Carmine Infantino on art. Wasn't his best, but that was towards the end of his career (I think). He still had The Flash through COIE. I don't think the series was superb, but it's a nice reflection on the era. As per usual with Supergirl from that time period, we got a costume change halfway through. To all of you who don't own Sandman Mystery Theatre please please support this. I have the old trades and have been waiting for a conclusion for the last 5 years. I was never able to get a straight answer from Vertigo in the past if they were gonna finish it or not. I'm just hoping the final book will slot in nicely with the old trades (like Knighfall vol 2 did). Shadow of the Bat, yes please. Starman omnibus: After vol 3 was cancelled I said to hell with it and instead managed to pick up the 6 hardcovers for a great price (got really lucky). I asked a DC rep at a con a few years back about this and said there were no plans to continue the trades but you could pick them up in digital. Not the answer I hoped for which prompted the purchase of the hardcovers. My worry is that they'll start over from the beginning and then won't sell enough so we still end up with the missing volumes. I'd rather they just reprint the one volume that is really expensive and then finish it out from where they stopped. Yeah, once upon a time I thought to start collecting Sandman Mystery Theatre trades and then didn't when I saw it wasn't finished; I'm equally inclined to wait this time (though I recognize that's self-defeating) to make sure actual progress is made. I didn't want to acknowledge that possibility but yeah very possible. Look at shade the changing man, I didn't want to buy them until the finished the series. Looks like I never will at this rate. Then again, maybe the new SMT trades will include the Annual and the Sandman Midnight Theatre special (written by Neil Gaiman!) that were left out of the old trades. The annual, IIRC, was pretty stand alone but the Gaiman special tied heavily into the events of the main series and so it could make just reading the trades a little confusing to someone who also didn't read the special. Either way, I'm picking it up. SMT is one of my all-time favorite comics, so I'll happily support the new trades in the hope of getting the whole series on my bookshelf someday. Just when I was getting all excited about the second Cassanda Cain volume, this apparent cancelation of the first one sure hit me like a bucket of cold water. Let's hope they'll re-solicit it. Also interesting: Amazon is listing Joe Kelly as one of the authors of JLA Vol. 8, so maybe my pipe dream of seeing Justice League Elite collected along with the series's last 32 issues will come true. And lastly, if DC considers (as it should) Rucka a big enough name to justify re-issues of his excellent Wonder Woman and Checkmate runs with his name in the title, then how long before the "Batman by Greg Rucka" collections? >> how long before the "Batman by Greg Rucka" collections? One more thing: If they're reprinting the 70s Prez issues, they should include Supergirl #10, where he costars. Cary Bates was the writer. You might've been thinking that Deathstroke book would read a bit funny without the "Total Chaos" issues when ...... and Deathstroke #14-16." I'm sorry, this Total Chaos thing is incredibly confusing to me. You say the solicit leaves out those issues, but if the issues are 14-16, they aren't left out...? I think he meant without other Total Chaos issues. Following from Deathstroke #14 Deathstroke trade could use at least fragments from New Titans #90 and Team Titans #1 (although the latter is mostly heroes standing around listening to the main villain's backstory), but at the beginning of #15 Slade goes on his own and spends the rest of crossover doing his own thing and appearing only in his title. Right. Which is to say, Deathstroke Vol. 3 will likely include only the Deathstroke issues of "Total Chaos." Which is not that big of a deal because only Deathstroke #14 was really related to "Total Chaos" and issues #15-16 really were not even though they were labeled as such. But if someone (in my imaginary scenario) were thinking, "I wish I had the other parts of 'Total Chaos' to read alongside this here Deathstroke Vol. 3 collection," then lo and behold there's also this Titans: Total Chaos collection, which will presumably also include those same Deathstroke issues. I'll take a Total Chaos collection, don't get me wrong, but a Total Chaos collection before a Titans Hunt collection is ... total chaos. I wish I was stoked by the announcement of Titans Total chaos...but whatever jaded titans fanboy I was, it had gone by the 90s...but if there are enough trades to put together a decent collection, I just might take a look. Unrelated, I think the Wonder Woman by George Perez Omnibus Vol 1 is as perfect a book as they come, build wise as well as content wise.